For the 30th consecutive year, Oklahoma Gazette readers went ape for all things local. After more than two months of voting, the winners are made in the shade. Dig this list of the best of everything that our metro has to offer. 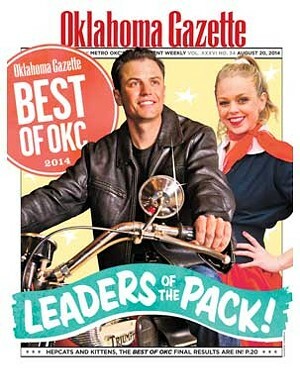 Now, at any time, when someone asks you, Whos the best chef in Oklahoma City? Wheres the best place to find a hipster? or even, Hey, Clyde, wheres the best scooter shop? youll have the answer. The answers are Bruce Rinehart at Rococo, Paseo Arts District and Indian Motorcycle. Best of OKC results are better than Google. Keep reading for boss places to cast an eyeball (museums, shops), the best places to play backseat bingo (or Best Place to Burn Calories, if you want to be formal about it), best places to scarf an exotic plate of grub, the best places to take your little monsters and more. In fact, there are close to 90 things you need to add to your bucket list right now. This list is radioactive, thanks to the guys and dolls (thats you!) who have made the truly unique Best of OKC awards a success for three decades. This isnt rigged. Nobody paid for placement. We received more than 200,000 votes, and you have spoken. Your vote counts, and this list is tight. Click below to check out the winners !